ALE’s new Mega Jack 800 system has been in action for the first time as part of a bridge installation in the Netherlands. 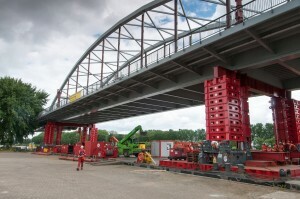 UK-based heavylift services provider ALE’s system, launched in June, was used in the load-out, transport and installation of the 1,570t Loenerslootse Bridge over the Amsterdam-Rijn canal in Nigtevecht, as well as the removal of the old 1,630t bridge. ALE said the Mega Jack 800 is designed to bridge the gap in capacities of its current solutions and able to integrate with other heavylift equipment. The system’s jacking towers each has a capacity of 800t, with multiple towers able to be combined with a starter to beam to create 1,600t and 2,400t capacity per jacking point. It can also combine with other services, such as skidding systems, to provide a complete solution for bridge launching. The Dutch project was conducted in phases and also involved climbing jacks, SPMTs, barges, strand jacks, a heavy skid system and Liebherr LTM 1400 and LTM 1500 mobile cranes. The new bridge was transported to site by river on connected barges and an inland vessel. The Mega Jack 800 was then employed to jack up the 1,250t bridge deck to 9m from the barge deck. Removal of the old bridge and installation of the new one took under eight hours. Jack-down of the old bridge to end height for demolition also used the Mega Jack.